How to Write a Dialectic Essay? If you are asked to write a dialectic essay, the process will require you to find a controversial topic for exploration. Because of this, it can help to begin by looking through articles in journals, newspapers, and on the Internet. This will enable you to collect sufficient information on the topic you intend to discuss. Remember to cite all materials properly and pay careful attention to the academic style or format you have been instructed to or chosen to use. It is possible you will find quite a bit of helpful information on the Internet about writing this type of essay. One of the most important factors is to choose reliable and credible websites. Additionally or alternatively, you are welcome to use the instructions provided below. “How to write a dialectical essay?” is one of the frequently questions that many students try to find an answer to. The emphasis of such a type essay is in the presentation of the opposite points of view or attitudes concerning a certain issue and a bit different understanding of the problem under study. It implies objecting a specific technique and brainstorming with the key purpose to discover diverse ideas related to the chosen topic. The main essence of a dialectical essay is very controversial and essential. Throughout the process of writing, a person denies a specific fact or evidence, and presents controversial arguments. The key purpose of the author is to determine a novel objective of the well-known issue. The nature of the dialectical essay is very philosophical. It should be noted that this written task requires fascinating preparation, knowledge, as well as experience. Like any other essay type, it has its peculiar characteristics. To satisfy all the content needs, it is imperative to keep to the tips given below. Primarily, the writer will face the need to do some research in order to determine new perspectives of the issue under study. To deliver am amazing dialectical essay, it is of great significance to be competent in the chosen topic, as well as knowledgeable about it. The following assignment requires that students approach the problem utilizing various objectives. The essay is aimed at exploring a set of solutions instead of making emphasis on a specific one. Consider that whenever your teacher asks you to complete such an essay, it means that he / she is eager to estimate your thinking flexibility and creativity, as well as the skills aimed at clarifying the ideas or considerations regarding a specific subject or topic. A writer of a dialectical essay should discover both negative and positive aspects of the issue / problem and provide all the pros or cons concerning the chosen issue. The structural elements assisting in writing a dialectical essay can be easily seen if you refer to dialectic essay examples available online, but we would like to focus on the most important of them in the article below. There are essential constituents of the structure giving a clear explanation on how to write a dialectical essay. Take into account that the dialectic essay should comprise five paragraphs. Every of them has its peculiar features. The introduction one should include a thesis statement. The thesis statement may have two interpretations. Essentially, it should be formulated in such a way the writer may approach it from two different perspectives. Further, in the essay, it should provide the readers with the controversial ideas. The format of the introduction should be clear, short, informative, and eye-catching. In an ordinary essay, the body is composed of two-three paragraphs, which can either support or deny the key thesis argument or point of view. On the contrast, the characteristics are different in a dialectic essay. After the introduction, there should be an argument paragraph. The task is to give one argument that supports the key thesis. It is possible to provide the readers with certain reasons, why it is worth supporting this key thesis. The objection paragraph is supposed to be the next one. The task of the author here is to object the statements indicated in the precious paragraph. There is on the significant nuance that the author should be well aware. It should be stressed that the objective section does not have to comprise the sentences which content denies the thesis statement or doubts of its rightness. The third paragraph of the body is referred to as a response. In the following part, the writer should respond to the statements indicated in the objection section of the essay. You ought to specify it clearly. Consider that you should not provide any novel arguments. You should present a critical approach in your essay. The last element of a dialectical essay is the conclusion. The task of the author is to formulate the results of the debates presented in the work. The writer should take a decision which viewpoint is valid and reliable and should be paid attention to. Sometimes the composition of several points should be credible and reliable. Moreover, the writer should present some piece of evidence that supports her / his position, in some cases even through the prism of the opposing arguments. In case, when the writer changes his / her viewpoint, he /she should explain to the readers each point or consideration. The writer should provide some reasons, as well as defend her / his point of view throughout the essay. Once the essay is ready, you should read it very carefully and make the final adjustments. It is of great significance that the conclusion ought to support the thesis statement, as well as the arguments presented in the essay. The opposing arguments ought not to deny the key statement of the essay. However, they should object the other pieces of argumentation provided in the dialectical essay. Always keep in mind that a dialectical essay is a type of writing that approaches the set or chosen question from two different angles, which are opposite. The conclusion means the alternative viewpoint is based on the data looked into. The task of the author is to search for the disputes, contrasts, as well as oppositions. Then it is imperative to search for the key idea that will combine all those points and make it the most significant issue of your writing. While working on your dialectical essay, you should utilize your dialectical thinking. 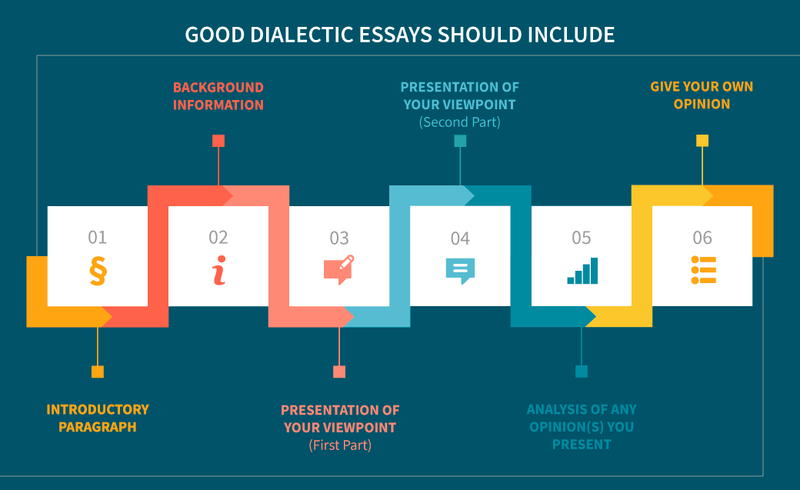 The structural characteristics of the dialectical essay allow combining the controversial viewpoints and make it look logically organized and full of sense. There are a few techniques that can be applied during the writing process. You can utilize a con and pro collection grid. The following technique can help you arrange all of your points of view accordingly and avoid creating a mess in your work. Moreover, you can always apply the brainstorming technique in case you lack some ideas. The format of the essay is also an important criterion affecting the quality of writing. It concerns citing, as well as plagiarism and editing issues. In the majority of cases, the dialectical essay should comprise about 600-800 words. In case there is a necessity to clearly realize how to write a dialectical essay, you should not get worried or panic. Make sure that you know all its peculiar features, are well aware of the requirements, as well as have critical thinking. Without doubt, you will be able to prepare a dialectical essay of premium quality! A presentation of the various opinions on the topic you will be discussing. The main point that demonstrates why it is important to explore the particular topic you will be discussing. Provide your readers with any background information you think will be useful. Identify the main point or idea of your paper and focus on this. You should use this section to provide as much powerful and reliable evidence as possible. This means presenting an opinion you will go on to support. Say why you believe your opinion is objective and valid. Provide information on any experts who agree with your chosen viewpoint. You should use this section to examine the main point or idea of the work you are exploring. Give a further opinion on the topic you are examining and make reference to others who support this. Offer a few well-reasoned arguments in support of this point of view. Mention any opposing viewpoints and say why you think these are not valid. Analyze any arguments that support or oppose your viewpoint. Give your own opinion on the topic. Towards the end, present any conclusion(s) you arrive at. Why have you taken a particular stance? Set out solid arguments to support your choice. Do not overlook the importance of including any historical facts or information that is relevant to your topic’s development. Pay attention to spelling, punctuation, and grammar. Try to make your essay or paper as gripping as possible. Establish whether your readers already know anything about the matter you are examining. Is the information you provided correct? Is your chosen topic sufficiently important or significant? Are people likely to act in the exact same manner in different circumstances or situations? Is it important that everyone be treated equally?